Barely old enough to vote, Nolan Gorman is making himself a household name in Minor League circles. Just six weeks into his professional career, the 19th overall pick has been selected as the Appalachian League Offensive Player of the Week for July 30 through Aug. 5 after going 12-for-23 with three dingers, three doubles, eight RBIs and seven runs scored. It is the first career Player of the Week award for baseball's No. 100 prospect. The 18-year-old entered the Draft with a reputation for power after bashing 10 homers while hitting .421 in 31 games his senior season at Sandra Day O'Connor High School in Phoenix. Gorman won the Under Armour All-American Game Home Run Derby at Wrigley Field in 2017 and was a finalist in the MLB All-Star High School Home Run Derby that same year. His power stroke has been on full display since suiting up for Rookie-level Johnson City. 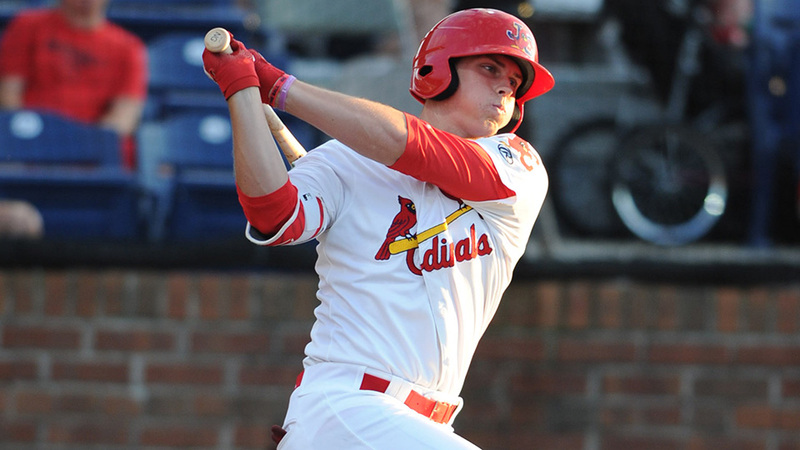 Gorman cranked his first professional roundtripper in his second at-bat with the Cardinals on June 19 and notched his first multi-homer game 11 days later. He's gone yard in four of his last six games, including three straight contests from Aug. 2-4. Gorman's .677 slugging percentage is tops in the Appy League, while his 11 homers, 21 extra-base hits and 40 runs scored each rank second in the circuit. The third baseman's 90 total bases sit third, two behind the leader Jordan Qsar. "Just going day to day, honestly," Gorman told MiLB.com's Gerard Gilberto after a four-hit effort Friday. "Working with hitting coach [Cody Gabella]. Keeping my approach simple and just kind of letting my natural swing and ability take over." The third-ranked Cardinals prospect has reached base safely in 32 of his 34 games with Johnson City; the last time he did not reach base was June 22 -- his third professional game. Gorman has 12 multi-hit efforts, including three with at least three hits. He amassed a .522/.560/1.043 slash line this past week and is in the midst of an eight-game hitting streak. "Honestly, there's nothing I do superstition-wise," he told Gilberto. "I can't think of something in particular that kind of got me on a roll here. Just honestly, sticking to my approach and my routine every single day. That's what really helps a lot."